“Sharon is to be admired for his commitment to cause of the State of Israel, the land of Israel, what it is, what it took to build it and what it took to defend it and what it takes to defend it. He had no higher calling than to Israel, a country, a people and an idea. The Jewish people so often victims, have the right to a state where they could be independent and free, afraid of no one and equal to everyone, judged not on prejudice but on merit, on what they achieve and on what they give of their own free will. So think good, or ill of Arik Sharon, agree or disagree with him but that calling to serve Israel was unalloyed. Arik Sharon. Tough, shy, indomitable, yet a servant to his people, a warrior to his people but wise enough to know that war alone could not secure its future. He was warrior of this land and let him take his place in the history of Israel with pride”. (Tony Blair at the burial of Sharon). If one were to take Tony at his word alone then one would really think that indeed Sharon was a great man. That however is a problem with much of what Tony Blair represents. Without historical contexts, real people and actual consequences he would be the ultimate PR spin doctor for war criminals. It takes a war criminal to speak so well about a war criminal, a facilitator of mass murder and a political thug. The facts of history lift the heroism, commitment and vision of Sharon from the cardboard and one is left with an ugly picture. Sharon committed his first war crime in 1953 in the West bank village of Qibya. He was a major in an operation where houses were blown up and 69 civilians were massacred. The international community had given away what did not belong to them in order to salve their collective conscience for the Holocaust. Those villagers in Qibya were paying the price for crimes committed in Europe as Sharon and his troops spilt innocent blood. Their creed was never again would their people be slaughtered even if Palestinians were to die to make that point. This tough soldier was then to go on for another fifty years to use brute force. He was of a generation that chose not to follow the dictates of the God that they claimed had promised the land of Palestine to them. God had no claim on Sharon but he held God to His word. If God took too long Sharon would shoot his way to force an answer from God. Thus he has been blowing up and bulldozing houses of defenceless civilians, his enemies. He joined the terror gangs before the establishment of the State of Israel. His racist people came to love him because he epitomised the very opposite of a victim. The neighbouring Arab states were destabilised and Palestinians, under occupation would be harassed, stopped-and-searched, houses bombed, sons, daughters and husbands imprisoned, land dispossessed and occupied. That was the bread-and-butter of Sharon’s political, military and moral authority. These were the dimensions and properties of his heroism and commitment. It was soaked in blood of innocent Palestinians and his people applauded. Very few have been prepared to identify the perpetrators, victims and bystanders in the blood-soaked history of Sharon. In 1955 he led an attack on the Egyptian-led Gaza. 38 Egyptians and eight Israeli soldiers died. A year later Sharon would be involved in the attack on Egypt together with Britain and France. It was a disaster for Israel but Sharon was always one to get up again. He would always get up. That is what his people loved about him. In 1967 he was the leader of the IDF Southern Command. That was the wars of occupation and he had to bring Gaza under control. For that he had to destroy thousands of homes. Yes, bulldozed at least 2000 homes in Beach Camp. More than 16000 people were made homeless. Sharon in Gaza refined the use of Zionist settlers to control the population under occupation. When he withdrew from Gaza years later it was to implement the refined strategy on the West Bank to secure control of Jerusalem as the eternal capital of the Jewish state. 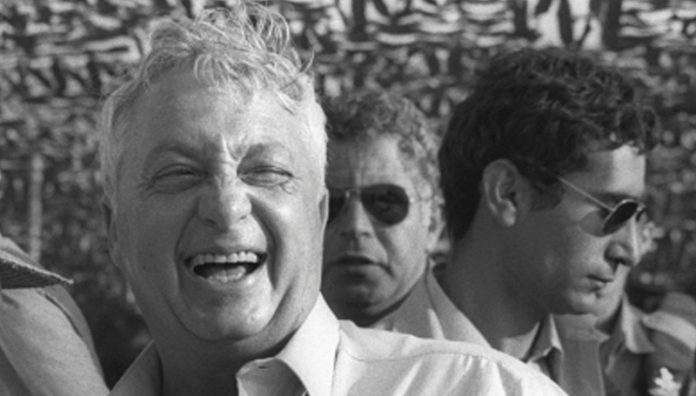 In 1972 he retired from politics and pursued his military career in the Knesset. This was not a typing error. It is stated as it is. To Sharon the Knesset was another theatre of war. In 1973 he played a stellar role, from an IDF perspective, in the Yom Kippur War. Golda Meir had recalled him and given him carte blanche to do as he saw fit. In 1981 Menachem Begin appointed Sharon as Defence Minister. Between 1948 and Begin the worst crimes against the Arabs/Palestinians came from the liberal Labour Party. It says something about being Labour. In 1982 the Kahane Commission found Sharon “indirectly responsible” for the evening of 16 September 1982 Sabra and Shatila massacre as he was defence minister and had not done enough to prevent the massacres. Beirut was under fire from the IDF since June 1982 as Sharon had vowed to destroy the PLO in Lebanon. Noam Chomsky had called the findings of the Kahane Commission a white-wash. On 1 September, under USA marine supervision the PLO fighters left Lebanon. A cease-fire was agreed on 10 September 1982 between all the parties concerned i.e. Israel, the Lebanese factions. Israel hoped that Bashir Gemayel, a Maronite Chrstian would get Christians to support an alliance with Israel. On 14 September 1982 Gemayel was assassinated. Israel ignored the cease-fire and occupied west Beirut. The Israeli army was in complete control of Beirut on 16 September 1982. The Israeli army surrounded Sabra and Shatila Palestinian refugee camps and the Phalangists went in and massacred the Palestinians. The Christians believed that the Palestinians had killed Gemayel. Given that thousands of Palestinians were murdered in a pogrom facilitated by the commanding officer of the IDF stretches the meaning of indirect responsibility. Recently declassified documents show both the complicity of the USA and Israeli deception of the USA on this matter. Sharon told the USA that there were still thousands of terrorists in the camps who had not left on 1 September. The Phalangists were draining the swamp of terror. The USA felt that their facilitation of the departure of the PLO was to pre-empt an Israeli attack on the PLO in Beirut. The USA Ambassador, Draper, Secretary of State Schultz and President Reagan had expressed their outrage at he behaviour of Sharon and Israel. However, they have done the facilitation of war crimes of Israel before and they have continued doing so till today. The USA deployed marines to Lebanon and a year later in October 1983 the USA barracks were attacked and 2412 USA marines lost their lives. The USA left Lebanon. This incident shows a discrepancy between what power says and what it does. So we have Tony Blair’s eulogy of Sharon at odds with the facts of a war criminal, a facilitator of mass murder. Joe Biden said that Sharon was unwavering in his commitment to the security of Israel. He of course left out any mention of what that sense of security meant to the associated insecurity of displaced Palestinians inside Israel since 1947, the people under occupation daily being harassed, killed and disowned and dispossessed of their land, the illegitimate imprisonment of any and all dissenters and the denial of the rights of more than 6 million Palestinian refugees. Sharon is unwavering and determined on a blank slate. Anyone can be that. When the canvas is filled out with the blood of the dead and Qibya, Sabra and Shatilla and the twenty-year occupation of Lebanon then the picture takes on a rather bloody hue. In his role as Minister of Housing in the 1990s he expanded the housing of settlements with religious zeal in violation of international law. The demographic landscape of Israel was changed by Sharon. Yes, the EU says that settlements are illegal but they continue to have bilateral relations with Israel. The EU says that it supports a two-state solution and does nothing about a big obstacle to that end. As Minister of Foreign Affairs he told the west to F*%£ off as he knew that they were unable to act due to their complicity in the Holocaust. He had them by the nuts and he got his pound of flesh from the EU and the USA. The rest of the world did not matter to Arik Sharon. In 2001 he “visited” al-Aqsa and the second intifada started. This was Sharon testing the resolve of the Palestinians. Sharon was voted as Prime Minister in Feb 2001 with a landslide mandate to crush the second intifada. The Palestinian leadership has failed to build on the spontaneous resistance of their people. At Karbala when we say “Ya Abbas” then it is with a sense of admiration for a principled fighter. When we say “Ya Abbas” in the Palestinian context then it is a sign of despair. As Prime Minister (2001-2006) he withdrew from Gaza (August 2005) but that was not to secure peace but to rid Israel of a demographic time bomb of 1.5 million Palestinians under direct occupation. He withdrew 8000 settlers from Gaza to secure the 450 000 settlers on the West Bank. The stranglehold by Israel and Egypt on Gaza has continued ever since. He agreed to the construction of the Apartheid Wall that separates illegal Israeli settlers, on occupied land, from Palestinians on the West Bank. A settler colonial occupation manoeuvre was presented as a courageous move for peace. Even the UN Secretary General spoke in glowing terms about this brave move at the funeral of Sharon. Very few senior staffers at the UN agree with their Secretary General on this matter. They could not even speak the truth when Sharon was dead despite the fact that his eight-year coma should have toughened their tongues. His settler project on the West Bank was always clear. Expand the demands around Jerusalem but the irreducible non-negotiable part is the settlement bloc around Jerusalem. They will give up the 80% that they never wanted in the first place. But that 80% of the West Bank will be given as a bargaining tool. The Palestinian negotiators are in the ICU where Sharon was for 8 years. Even from his hospital bed they could not free themselves from the web Sharon had spun. They are —— by a man who used to be in a coma and is now buried. From his grave he controls the oxygen supply to their ICU unit. Sharon was not a hero but a thug with bigger toys and backup than the poor boy down the road. The mafia works on the same basis. You can be the toughest guy on the street because the boss is on your side. On your own way, you do wet your pants in a tight spot. Sharon, may God curse him, is dead and the Palestinian leadership appears to have slipped into a similar coma or rather those who have been involved in Oslo process have been in a twenty odd-year coma, but the Palestinian people are still alive. Perhaps barely resisting because their cause has been a casualty of the Arab Spring/Winter.